Combine above ingredients and press into the bottom and 1” up the side of a greased 8 or 9” springform pan. Place in refrigerator. In a blender, blend the raspberries until smooth. Add water, if necessary to equal 1 cup. Combine the sugar and cornstarch in a small saucepan; stir in blended raspberries. Cook and stir over medium heat until thickened and bubbly. Reduce heat; cook and stir 2 more minutes. Stir in lemon juice. Remove ¾ cup sauce; cool slightly without stirring. Cover remaining sauce and chill until serving time. Combine cream cheese, sugar, flour and vanilla in a large mixing bowl. Beat with electric mixture until light and fluffy. Add egg whites, beating on low speed just until combined. Stir in cream. Pour half the mixture into crust-lined pan. Drizzle the ¾ cup raspberry sauce over cheese mixture in pan. Carefully top with remaining cheese mixture, covering sauce. Place springform pan in a shallow baking pan in a preheated 375º oven. Bake for 35-40 minutes, or until center appears nearly set when shaken. Cool on wire rack for 15 minutes. Loosen crust from pan sides. Cool 30 more minutes; remove sides of pan. Cool completely. Chill at least 4 hours. 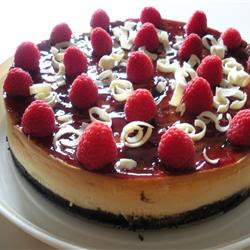 At serving time, top cheesecake with 1 cup raspberries. Stir liqueur or juice into remaining sauce and heat until warmed; spoon over cheesecake. Your raspberry cheesecake photo looks yummy! i'm drooling now. Thanks for sharing your recipe.